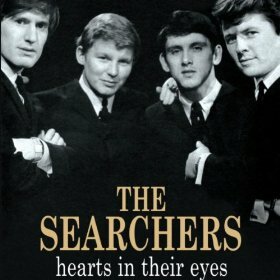 With 121 tracks over four discs, this is an impressively thorough compilation of material from The Searchers. Their hits have been re-released in various best of and other compilations on a number of occasions, but their more obscure material has generally been overlooked and has been much harder to find. This compilation includes both the hits and the more obscure materian in a comprehensive overview of the bands career. Timed to celebrate the band's 50th anniversary, this 4 disc box set covers the whole span of their career starting with tracks from the 10” demo LP that they recorded at Liverpool’s Iron Door Club which includes the arrangement of “Sweets For My Sweet” which helped win them their Pye recording contract. The set includes various live material recorded at Hamburg’s celebrated Star Club in the spring of 1963, all the many UK and international hits they recorded during their time with Pye between 1963-67, plus various other EP and LP tracks and a number of collectors’ oddities, including brief clips from a handful of BBC Radio interviews. After leaving Pye, the band recorded for various other labels and this colection includes some of this material including ”Shoot ’Em Up Baby”, versions of Neil Sedaka’s “Solitaire” and The Bee Gees’ “Spicks And Specks”), “Hearts In Her Eyes” and “Love’s Melody”, “I Don’t Want To Be The One” and much more. Bringing the story fully up to date, the collection closes with a couple of 21st Century live recordings. The set comes with an impressive 64-page booklet featuring a substantial history of the band by rock music writer Bob Stanley, a foreword from Jon Savage, input from all of the surviving Searchers, plus a number of rare photos. It's noticeable listening to these discs that the songs are so short compared to most songs these days - hardly any are over 3 minutes long, with most being slightly over 2 minutes. The advantage is that more songs can be included in the collection, and the songs certainly dont suffer from the short durations and in fact the style of the music does seem to benefit from keeping things short and snappy. It's taken quite a while to listen to the whole of this collection, but it's been very enjoyable - there really is some great stuff in this collection and listening to the album has been a real pleasure. Typing out the track listing - less so. This really is an impressive collection from one of the biggest Merseybeat bands of the 60s. They clocked up including six top ten hits including three number ones, and also had four top ten albums, and as you'd expect these hits are included in this collection. For any Merseybeat fan, and Searchers fans in particular this is a fantastic collection. A great release that would make a great addition to the collection of any Searchers or Mersybeat fan. 18. Have I Done Something Wrong?